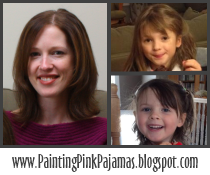 Painting Pink Pajamas: Toddlers in the Kitchen: Lessons Learned! They say you learn something new every day. Well, yesterday's baking attempts taught me two lessons! I woke up early, got a shower before C woke up, and we finished breakfast in record time. I thought it would be fun to do some baking and re-stock the freezer, so C and I started making a double batch of muffins. Mid-way through the recipe, I realized that we were missing a couple of ingredients, and we had to go to the grocery store. So I learned that I should always check my ingredient supply before starting to cook, even for pantry staples that we always have (like raisins)! This is a biggie. After returning from the grocery store, my little helper and I mixed the wet ingredients. Then the phone rang. As I was writing Hubby's dentist appointment on the calendar, I turned my back on C (I'm sure you get an idea of where this is going). All of a sudden I hear glug-glug-glug-glug-splash! I turned around to see C pouring the entire bottle of vanilla into the bowl! Thank goodness the dry ingredients were in a separate bowl. It was really hard not to laugh, actually, but also discouraging because now we were out of vanilla, I didn't have enough eggs to make it again, and I didn't want to drive to the grocery store twice in one hour! Thank goodness for neighbors that you can borrow baking ingredients from. 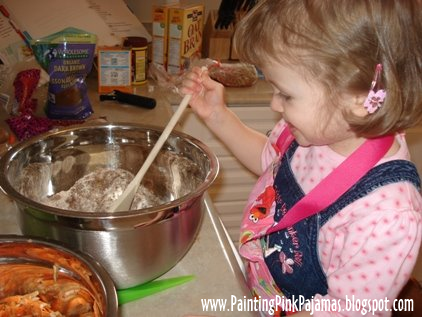 So take it from me, don't turn your back on a toddler in the kitchen - your little helper might decide to personalize the recipe! As a side note, I have no idea what I said to the receptionist on the phone! When I looked at the calendar last night, I saw that I'd only written 12:30, and the 0 was a squiggle going off the side of the page! After our adventures, the muffins turned out well, we have a stocked freezer, and Mummy's a little bit wiser! The muffins sound super yummy. I think it's a constant evolution with little ones in the kitchen. I've gotten in the habit of putting things higher when I have to run out and help the baby or answer the phone, but she still seems to find something to make a mess of. Now I try to remember to take her with me! Sometimes a pain, but always less messy. Hahahaa... I think I know why my mom never really had us 'help' her in the kitchen. No offense to my mom, but she didn't have the patience for that kind of thing. It's great fun though to do those sorts of things together!